Ha Chu is a stand up comedian from Hong Kong. His unique comedy style has brought him to stages across Asia, Australia and Europe. He is the first comedian from Asia to perform at the Christiania Comedy Club (Denmark). 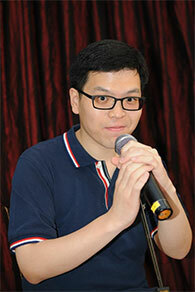 He was chosen by Melbourne International Comedy Festival to perform at the MICF- “Comedy Zone Asia”. He is a regular at the Hong Kong International Comedy Festival as well as the past winner of the Hong Kong International Comedy Competition.